BRANSON, Mo. 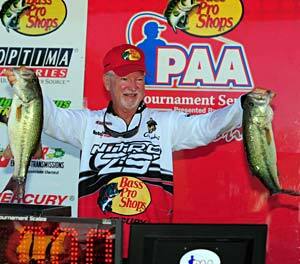 (June 23, 2011) - For Nitro pro Stacey King, everything about the first day of the Bass Pro Shops PAA Tournament Presented by Carrot Stix went according to plan. He caught a big bag by 8:30 am, culled twice more up to 20.12 pounds, and stayed off many of his best spots. For Kentucky pro Mark Menendez, the beginning of the day looked like it was going to be a disaster. After running aground en route to the take-off site, he feared that he might not even get to fish. Thanks to the help of some of his fellow pros, his boat was towed off the offending mud bar. Their helpfulness came back to bite them as he sacked 18.60 pounds of Table Rock bass and sits in second, just a pound and a half behind King. Kelly Power (17.87 lbs. ), James Watson (17.07 lbs.) and Brian Travis (16.73 lbs.) round out the top five. Today’s slick conditions and lack of man-made current slowed the bite for some, but it didn’t hurt King at all. He relied upon decades of experience on Table Rock. Menendez didn’t practice yesterday, having figured out a “one-two punch” that he felt could last for three days of competition. But his relaxed state of mind came to a grinding halt along with his boat when he ran onto a shallow bar in the dark prior to blast-off early this morning. “It’s pretty scary when you’re putting along in the dark and come to a complete stop,” he said. His boat and motor suffered some damage due to the impact, but not enough to prevent him from fishing. He caught keeper fish all day, and stated that he had “lots of extras.” His haul included the big fish of the day, a 5.53 pound largemouth that he caught around 8 o’clock. Missouri pro Kelly Power didn’t suffer the same sort of morning mishap as Menendez, but his day didn’t get started the way he wanted it to, either. After catching three quick keepers, he lost several near the boat and broke another one off. “Then someone told me that Stacey (King) had 18 pounds so I put my head down and fished harder,” he said. Unlike many of the pros who are catching their fish in the shallow bushes, Power, another Table Rock expert, is dragging a peanut butter and jelly colored Jewel football head jig in 15 to 18 feet of water. James Watson of Waynesville, Mo., another Table Rock stalwart, sits less than a pound behind Power and just over four pounds out of first. His catch included a 4.99 pound largemouth. Unlike the other two Missourians in the top five, he’s fishing shallow. “I love to flip so I kept my flipping stick in my hand all day,” Watson said. “I got three quality bites.” While he may not be fishing the typical seasonal pattern for Table Rock, he is relying upon history, fishing specific stretches of bank that have produced for him in prior years. “I guess you could say I have a little bit of home field advantage. I’m fishing with a lot of confidence.” His primary lure was a Luck E Strike Ringer worm in the tequila sunrise color pattern. Rounding out the top five is Frog Tape pro Brian Travis who is not a Table Rock local, but nevertheless relied upon past experience to amass his big limit today. “I have confidence in a few areas that I fish every time we come here,” he said. He has his water to himself, but like King he amassed the bulk of his weight early in the morning. After 8 o’clock he had trouble getting keeper bites. & Transmissions, Mercury Marine, Boat U.S. Foundation, Fishouflage, U.S.